Following is a free marketing plan sample and free marketing plan template which you can download, customize and print. The marketing plans are provided in both image format and .doc (Microsoft Word) format. The marketing plan template is a blank marketing plan template including: a cover page, a table of contents and all necessary headings and is available in .doc (Microsoft Word) format. 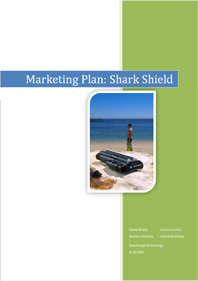 The marketing plan sample is a 5000 word marketing plan for the product ‘Shark Shield’ and is available in either image format or .doc (Microsoft Word) format.